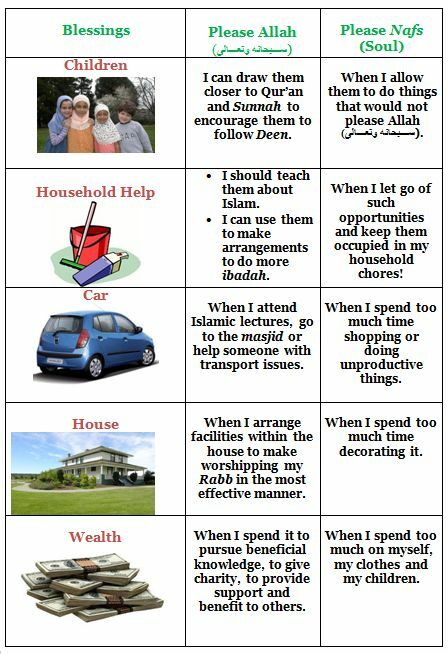 ← Action Plan: How to make my entire life an Ibaadah? In Surah Sad Ayah 30, we see the examples of Dawud (عليهِ سلام) and Suleiman (عليهِ سلام). We see how so many things like the Jinn, the birds and the mountains were made subservient to them and yet they were able to pass their tests in the most exemplary manner and receive the title of “excellent servant” from Allah (سبحانه وتعالى) Himself! Subhan’Allah! So I learn that once a blessing has been given to me, either I can use it to please Allah (سبحانه وتعالى) or please my nafs (my soul). Things that are subjugated towards me include my children, my help, my car, my house and my wealth. Here is the chart for how I can choose to use these blessings. Oh Allah (سبحانه وتعالى)! Make all my blessings a means of bringing me closer to You, rather than away from you. This entry was posted in Reflections and tagged blessings, Dawud (AS), Excellent Servant of Allah, Naimal Abd, Pleasing Allah, Pleasing Nafs (soul), Suleiman (AS), Surah Sad. Bookmark the permalink. 4 Responses to Satisfaction Guaranteed! This reflection was about the blessings that Allah has bestowed upon us and how we should be grateful to him for the things that he has given us. It is always important to be thankful to Allah for the blessings and mercy that He has bestowed upon us and how we can call people towards the Quran. SubhanAllah the concept of ‘excellent servant’ is so amazing! Something we need to strive towards as a goal and objective in life InshaAllah…to live life and perform acts of worship with the Allah consciousness ( as if we can see Him) and if not that then atleast as if He is watching us! !